Visit Britain regularly measure the UK performance in terms of key trends such as number of visits, journey purpose and the different modes of transport visitors use. 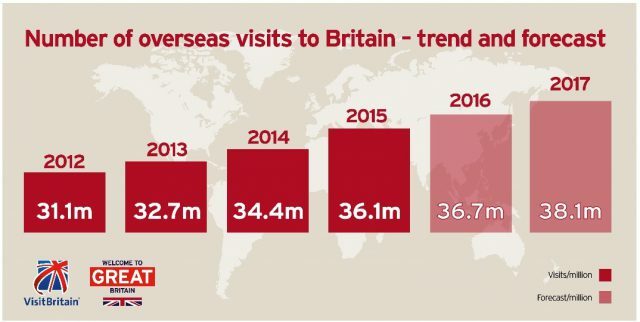 Visit Britain has forecast in 2017, visits will grow by 4.0% to 38.1 million. This represents a faster rate of growth than their projection for 2016. Here are the latest tourism insights. 1. International tourism – for January to September 2016, international tourism arrivals were up 3.7% year on year. Visits to Europe overall were up 1.6% and the EU up 4.1%. 2. UK inbound arrivals – these were up 1% compared to the same period (July to September 2016) in 2015, this equates to 10,655,000 arrivals and their spending was up by 3%. 3. EU referendum – since the EU referendum the value of GBP has fallen significantly meaning that the UK is now much more affordable for many visitors, in fact visit numbers from Turkey were up in Q3, contributing to a strong year to date and record breaking figures for the 12 month period at 207,000. 4. Reason to visit – visits to friends and family (VFR) have seen large growth in the last four quarters, up 8% and a new 12 month record and business visits were up 4% which set a new 12 month record, however spend has decreased by 4%. 5. How they travel – travel via air continues to increase, the most recent 12 month period set a new record at 27.07 million visits, yet visits via the tunnel or sea remain more stable, with tunnel visits growth at 1% in the past 12 months, and sea visits were flat. 6. Where they visit – growth in visits for the Rest of England is currently outpacing growth in London and visits to Wales grew 9% in July to September 2016 and set a new record for the year to date. 7. International markets – many countries experienced a decline in visits in July to September 2016, although USA visits increased 7% to 1.2 million and Irish Republic visits increased up 20% to 846,000 setting a new quarterly visit record. 8. European visits – visitors and spend are both up for Netherlands, with the most recent 12 month period setting a new record at 2.1 million visits and visits from Austria were up 12% in the last 12 months, visit numbers from Spain have increased sharply over the last two years, and continue to grow. 9. Long-haul visits – the USA is one of the UK’s biggest inbound markets, it saw strong growth in July to September 2016 boosting the 12 month period by 6% to 3.4 million visits. Visits from New Zealand were up in Q3, and the last year has seen growth of 14%. 10. Asia and Gulf – India continues to generate high volumes of visits, Visits from Malaysia continue to grow and Bahrain and Oman show an increase in visits too. Visit Britain assume that there will be no unforeseen major events that will significantly disrupt travel to Britain, e.g. related to security, health scares or natural disasters. View the full Inbound Tourism Trends Q3 2016. This entry was posted in alexandrapatrick, Marketing Campaigns, statistics and tagged facts and figures, UK Tourism. Bookmark the permalink. ← How is the UK ageing population transforming?